A few weeks ago, I added this beautiful kitchen to the CASA PYLA feed. I was really taken by its muted tones, simplicity and minimalist style. 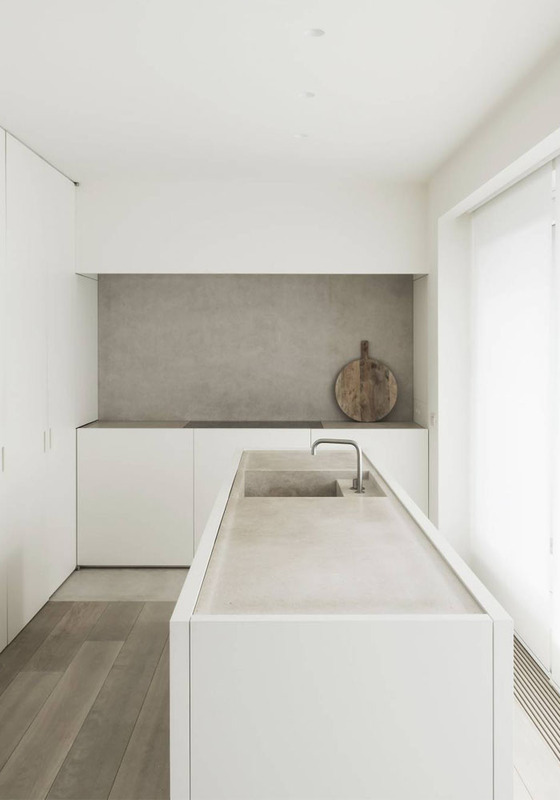 It’s not the first time that I find spaces designed by Belgian Architect Vincent Van Duysen beautifully stylish, simple and timeless. The man is a master at architectural spaces with muted tones and textured minimalist walls. Residence DRD is a duplex penthouse in Knokke with sea view of the Belgian coast. The main kitchen island is made of a single slab of granite to form the counters and the sink. The tap looks similar to the beautiful minimalist taps designed by Cocoon. It’s a weekend home designed to unwind as well as to be together with family and friends. The use of white and light, natural colours and natural light contribute to the feeling of calm. In the main living area, Van Duysen designed low-level storage space connected to the wall. They serve as seating too. The large seating area is turned to the sea while the dining area and kitchen are directed to the terrace at the rear. The bare wall hiding the fireplace enhances the spaciousness of the living area. The top floor accommodates the sleeping zone with 3 bedrooms and 2 bathrooms. Sadly I couldn’t find more pictures. The materials used for the floors and furniture match the colours of sand and sea while the white walls recall the white beach cabins one often spots on the Belgian coast. Those natural colours have gently rubbed on me since we moved by the beach in France. I still use a lot of white to bring as much light as I can (and painting a room in white is always cheaper than adding windows) but little by little, natural accents pop in in our home. Fingers crossed, we will see more of them in our next renovation project. What do you think of this space? Is it something that you find calming or not your cup of tea at all!? Are there any details that inspire you? The flat is totally inspiring. Minimalism with class and then some. LOVE.